WASHINGTON - Four talented American children will have their visions of the future immortalized when their original designs are turned into U.S. postage stamps next month. Zachary Canter, 10, of Kailua, Hawaii; Morgan Hill, 10, of Montclair, N.J.; Sarah Lipsey, 12, of Memphis, Tenn.; and Ashley Young, 12, of Sandy, Utah, competed in a global Postal Service project called "Stampin' The Future." The issuance ceremony will take place at noon on July 13 at the Anaheim, Calif. Convention Center as part of the Postal Service's World Stamp Expo 2000. Stampin' The Future sparked the creativity of students 8-12 years of age by asking them to illustrate in a stamp design their dreams, hopes and visions of the future. 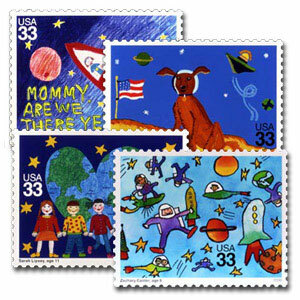 The four U.S. designs, along with winning designs created by children from around the globe, were unveiled August 22, 1999, at the Universal Postal Congress in Beijing, China. The congress is a regular meeting of the world's postal administrations. "I was very excited when I got the letter saying I was a winner," said Morgan. "I've told half my block and they think we should have a block party! I've called my grandparents and they were really happy." "We were studying space in school," said Ashley when asked how she came up with the idea for her winning design. "I thought about showing myself in space, but then I love animals so I decided on a dog." The World Kids Congress, which will be part of the World Stamp Expo 2000, is a forum where U.S. and foreign winners of the "Stampin' The Future" design project will participate in the official celebration of their achievements, and be honored guests at the dedication ceremony of the winning U.S. postage stamps. Some 94 children from around the world will participate. Out of 120,000 participants in the United States, a total of 110 schoolchildren were chosen as finalists. The four winners, selected from the 110 finalists, were recommended by members of the Citizens' Stamp Advisory Committee. Final selection was made by the Postmaster General. The four U.S. winners will help dedicate the stamps bearing their designs at World Stamp Expo 2000, the second international stamp exposition by the Postal Service. The show, scheduled for July 7-16 at the Anaheim Convention Center, will feature first day of issue ceremonies for the first hologram, circular and pentagonal stamps in U.S. history as well as the first day of issue ceremony for the Stampin' The Future stamps. The show will also include a 3-D "Space Discovery Theater," NASA space exhibits and displays, and many of the world's rare and priceless postage stamps.